schools. The summer internship will last six weeks, meeting three times a week for five hours at a time (see full schedule below). documentarians, and podcast producers will be invited to speak to the students about their career paths and act as mentors over the course of the program. interviewing, research, writing, and audio production that are crucial for college and career readiness. Who is eligible to apply to Teen Transmitters? What do I need to do to apply to Teen Transmitters? In order to apply, please fill out all four parts of the Teen Transmitter application (found below) and submit it by April 5, 2019 by 5:00 pm. Will I be paid as a Teen Transmitters intern? Yes, Teen Transmitters interns will be paid $15 per hour and reimbursed for travel expenses to and from the internship. *If you choose to apply, you must be available on these dates. 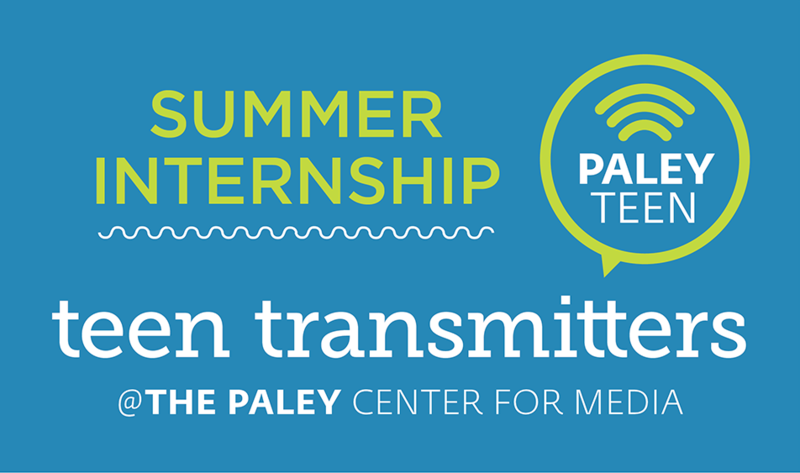 If you have any questions about Teen Transmitters that haven’t been answered by this application, please feel free to reach out to Caroline Quigley at cquigley@paleycenter.org. Thank you. We are no longer taking applications.